" Lisa Germano, from Indiana, debuted as a professional musician in John Cougar Mellencamp's band' she plays on Mellencamp's albums "The Lonesome Jubilee" (1987) and "Big Daddy" (1989). Jim Kerr saw Germano perform in the David Letterman Show (her debut with Mellencamp's band) and contacted her right away. After her guest appearance on Live In The City Of Light (where she overdubbed violin on Someone Somewere In Summertime), Germano's violin is now an integral part of Simple Minds' sound. " 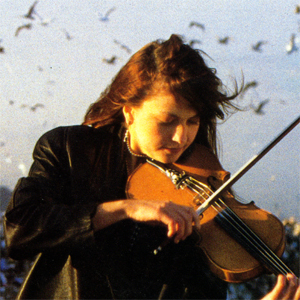 Lisa Germano was integral to the Street Fighting Years album and tour where she guested on violin. She was also the support act for Simple Minds when they toured the USA as part of the Good News From The Next World tour.